Supernatural: Sam. Dean. But not Sam and Dean. The evolution of Supernatural continues. We open with some scenes of domestic life, interspersed with similar scenes from hunting. Dean grabs the salt for the kitchen table, and we see a flashback to the Winchesters salting and burning bones. Dean uses power tools at work, and we see him slicing up a vampire with a power saw. It's an effective way to show how Dean's life has changed. And even more so, when Dean is sitting at a bar talking with his suburbanite neighbor about his past, explaining how he was in "pest control." "You wouldn't believe what some people have in their walls," he says. The waitress slips him her number. Dean doesn't do more than glance at it before tearing it up. That's the new Dean for you. Leaving the bar, he hears a scream, and he grabs his pistol and enters a building being renovated. He finds blood, and some large, scary claw marks, but nothing else. Later, he calls the police to see if any missing persons had been reported, but nothing. Lisa catches him, and he hides what he's doing. He checks to make sure his Devil's Trap is still intact under the front door rug before turning in for the night. The next day, he sees more claw marks, and stops to follow them to a neighbor's shed. Around the door, he finds sulfur, but he kicks it open, only to just a small Yorkie inside. His friend spots him, and asks if he was about to shoot the dog. Dean says he was. "I thought it was a possum. Remember when I said I was in pest control? Possums are vicious. They carry rabies." Dean hurries back to his own garage, and there, under a car cover, is Metallicar. Yet more symbolism for the difference between old Dean and new Dean. He digs some weapons out of the trunk, but Lisa catches him before he can leave. She asks what he's doing. He explains that he thinks something evil is near, and asks her to take Ben and leave for a while. She agrees. After she leaves, Dean hears a noise, and Azazel appears. He tells Dean that Cas came back, and Dean came back, why not him? As he chokes Dean out, Sam shows up, and plunges a needle into Dean's chest. Dean comes to in an abandoned house. He doesn't believe Sam is real. 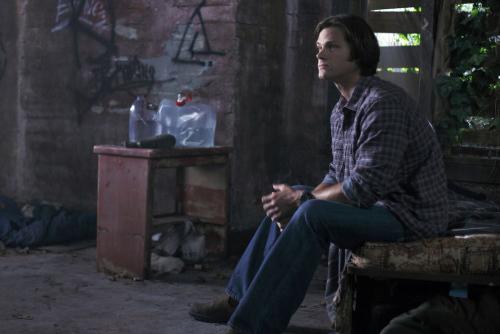 Sam performs all the standard tests - salt water, holy water, bleeding - to prove to Dean he's real, and human. Dean is astonished, and hugs Sam. Until he finds out how long Sam has been out - a year. Then he's angry. But Sam is unapologetic. He tells Dean that he finally got what every hunter wants - a good, normal life. Dean says he tried every way he could think of to get Sam out. Sam tells him that Dean promised he would leave Sam in Hell. "So sue me," Dean says. Sam is full of surprises - he also introduces Dean to some distant cousins. One final relative arrives - Samuel Winchester, Mary's father. Dean is shocked, how could Samuel be alive. Dean saw him die. Samuel can't explain it, he was just suddenly alive, just like Sam. And there are more strange happenings. The supernatural creatures aren't following the rules. Dean was poisened by a djinn. They normally find abandoned houses and remote places to keep their prey. Sam injected him with an antidote that Samuel created, and that's how Dean recovered. Dean wants to go hunt the djinn. He knows the djinn will be watching his house, waiting to catch him alone. He plans to be bait. But first, he calls Lisa and tells her to meet him. They go to Bobby's house. Bobby is surprised to see Dean. Lisa and Ben go to their rooms. Bobby tells them not to touch the décor. "Just assume everything's loaded," he says. Sam walks in, but Bobby is not surprised to see Sam. This makes Dean furious. How long has Bobby known? Bobby has known for a year also. But he tells Dean the same thing - he was out of hunting, and Bobby was not going to ruin that for him. Dean goes to talk to Lisa, and she tells him it sounds like he's saying good-bye. Dean sort of agrees, and Lisa tells him that this has been the best year of her life, and that she really hoped Ben would have someone he could look up to. Someone that could be a father to him. She really knows how to get Dean where he's most vulnerable. Back at the house, they see three djinn hiding in the woods watching. Dean goes into the house, and sees the djinn killing his neighbors. Sam tells him the neighbors are probably already dead, and that it's a trap to lure him out of his house. Dean knows this, but he can't let them die, they are his friends. He can't understand why Sam isn't going with him. Dean rushes over, right into the trap. The djinn poison him, and he hallucinates Azazel torturing Lisa and making Ben drink demon blood. Meanwhile, Sam is being attacked. He fights back with a golf club, but he's losing when Samuel shows up. They kill one djinn, while Sam rushes to help Dean and the neighbors. The other djinn, though, is captured and put into the van before Sam can see. Samuel, what exactly are you up to? Sam rescues Dean, and they prepare to go. Except Dean's not leaving. He's decided to stay. Sam asks if he realizes he's putting Lisa and Ben in danger. Dean tells him he's already put them in danger, now he has to stay to protect them. He pulls out the keys to Metallicar, and tells Sam to take care of her. "Uh, thanks," Sam says. "But I've already got my car set up the way I like it." Whoa. Things have really changed. And with that, the Winchesters part ways. For now. Here's what struck me about the season premiere - the characters behaved the way you'd expect them to. The Winchesters didn't just fall in step and act like nothing had happened. They've both changed. A gulf has opened between them, one that started some time ago, and gradually widened until the moment Sam allowed Lucifer to possess him. Not all of that gulf has been bad, some of it has even been necessary. Sam has established himself without Dean. He spent five years trying to make his own way as a hunter, and as a person, and he finally succeeded. Dean, for his part, has made peace with the fact that he is no longer needed to take care of Sam, and has found someone else to care for (not that Sam ever needed that care). I think it's going to be interesting how the brothers sort out their newfound independence. There is sure to be conflict as they try to avoid dropping back into the old familiar character patterns of big brother, little brother. The trick for the writers is going to be integrating the character changes into what we all like so much in the characters from previous seasons. Here's hoping they pull it off. I think they nailed it this week. The evolution of Supernatural continues. We open with some scenes of domestic life, interspersed with similar scenes from hunting. Dean grabs the salt for the kitchen table, and we see a flashback to the Winchesters salting and burning bones. Dean uses power tools at work, and we see him slicing up a vampire with a power saw. It's an effective way to show how Dean's life has changed. © 2010 The Fodder Network. That is all.